Message-Driven beans (MDBs) process business logic, they are different in that clients never invoke MDBs directly. They are trigger by messages sent to a messaging server, which enables sending asynchronous messages between system components. There a number of messaging servers like IBMs WebSphere, Oracles Advanced Queuing, etc. MDBs are used for robust system integration or asynchronous processing. The Java Persistence Query Language (JPQL) for searching and retrieving persisted application data. EntityManager - can add, delete, update and retrieve entities from the database. JPA provides a specialized SQL-like query language called the Java Persistence Query Language (JPQL) to search for entities saved into the database. It also supports native database specific SQL should you ever need it. The container is an extension of the basic idea of a JVM, but manages the memory on your behalf and provides services such as transactions, security management, remoting, web services. The EJB 3 part will provide services applicable to session beans and MDBs only, and putting a EJB 3 component inside a container is called deployment, once deployed it can be accessed via a client. To provide persistence you will require a JPA which can be plugged into the container, this means that you are freely to choice what JPA you want to use, JBoss Hibernate and Oracle TopLink are popular and you can mix and match containers with persistence providers. The EJB platform creates a pool of component instances that are shared by clients. All instances are returned to the pool when the client has finished with them. EJB makes all components thread-safe and highly performant in ways that are completely invisible, however complex the application. The EJB container manages state transparently. EJB supports declarative transaction management using simple configuration instead of code, the container can handle the commit and rollback of transactions. Integration of JAAS API, means that it is easy to implement security with simple configuration instead of code. EJB 3 introduces AOP in a very lightweight, accessible manner using interceptors. This allows you to separate out crossing cutting concerns such as logging, auditing and so on in a configurable way. EJB 3 can transparently turn business components into robust web services with minimal code change. 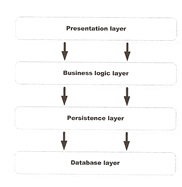 Automated persistence as an alternative to verbose and error-prone JDBC/SQL code. JPA provides a number of services geared toward data caching, performance optimization and application tuning, especially in large environments. The last thing to discuss is that because EJB 3 components are POJO (Plain Old Java Object), they can be easily executed outside the container. This means that it is possible to unit-test all components business logic using testing frameworks as JUnit. I hope to have a complete topic on JUnit testing in the near future.